Today we are discovering or, to be more exact, rediscovering that the inner and outer worlds of our experience are closely related to each other. What we see in the images and experiences of the outer world is in some sense dependent on what elements are currently active within our psyche. In that way outer images and forms can mirror or reflect, and, therefore, reveal living aspects of our inner world. Potentially, therefore, everything in our outer experience is a possible source of revelation of our inner realities and current state — as many mystics report. How we perceive and interpret events is very much a reflection of our individual selves. Just as there are underlying universal physical laws in the physical world, and underlying universal patterns of growth and development in the biological world, would it be so surprising to discover that there are also underlying universal patterns of psychological development which lie within the great myths and legends that have survived eons of human ages and development? Witness the frequent emotive and evocative use made of them by so many of the great poets. Today, the psychologist Jung’s discoveries and interpretations in this area of ancient myths and legends is now well known, and have been influential in dispelling the rationalist’s judgment that myths are no more than primitive and superstitious beliefs about non-realities, or primitive pre-scientific attempts to explain natural phenomena. Remember the myth of Daedalus and Icarus? In order to escape from the Labyrinth in which they had found themselves imprisoned, Daedalus made wings (of wax!) 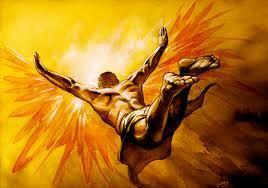 for himself and his son Icarus, but warned his son not to fly too high. Ignoring his father’s advice, Icarus soared proudly up towards the sun which melted the wax, causing Icarus to fall into the ocean and drown. ‘Trying to fly too high’ — with wings of wax’. Could a legend like that have originated without any deeper message for the hearer; without some inner significance that was the real reason for the story being told in the first place? Today we are perhaps uncovering some of the deeper awareness of the ancients which they were able to express only in story form. The difference is that, unlike them, we have an articulate psychological terminology with which to express it. And further would it be so surprising to find that the key stories within the ancient sacred scriptures are still alive and vibrant today, retaining their emotive and sacred power because they symbolically express deep universal spiritual patterns of human experience and development? The Buddha and Jesus are perhaps the best known ‘spiritual psychologists’ from the past, who demonstrated their incisive ability to plumb the spiritual and psychological depths in humanity through the use of symbol and parable, in the ancient scriptures as well as in their own parables, so many of which have also come down to us. For example, Jesus’ parable of the Prodigal Son with its universal experiential patterns has stirred up and brought to light countless deep spiritual emotions and insights in those who have been prepared to ‘hear’ it with an open spirit. Generally, ‘tales’ inevitably become embellished and details changed in the telling. But in the Old testament of the Bible we have a record of ancient religious myth and sacred history of accuracy second to none due to the meticulous copying skills and strict rules of the semitic scribes known as the Massoretes. Sadly, later interpretations of the Old testament by scholars and theologians in the Christian era became merely historical and literal, lacking spiritual and psychological depth so that it became largely dismissed or neglected as too archaic and repulsive for the modern mind. So it remained unrecognised as a potential revelation of timeless psychospiritual truths and inner realities concerning potentials divinely embedded in the human spirit, the obstacles to their development and the ways these may be overcome. The key to such deeper meaning became lost. It was not until the 18th century when rationalism was getting into its full stride that a psychospiritual breakthrough came. Emanuel Swedenborg, a distinguished philosopher, following a period of humbling transformative inner experiences, began to publish his revelatory writings. In 1747 he startled leaders of the Christian church with the opening statement of his great work, Arcana Caelestia (Heavenly Secrets). In the Genesis creation story Swedenborg sees how the emergent kingdoms of nature correspond to emergent levels of the human mind and spirit and so provide a universal key to the interpretation of natural images in all the subsequent stories in the Bible. Thus the story of Adam and Eve in the Garden of Eden with its two trees, the divine prohibition, Adam’s falling into a deep sleep, the serpent and the ignoring of the divine warning, reveals how the human spirit is drawn into an egocentric state which, spiritually, is dreamlike and inevitably becomes subject to negative consequences.Some form of psychospiritual rescue operation is needed which, as Swedenborg, shows, the Bible goes on to symbolically outline in detail. So the Bible will never become dated or irrelevant so long as the human mind is able to recognise its own universal inner states and stages of spiritual development reflected in the personae, events and dramas of such well-preserved sacred narratives.